This morning RedState.com editor Erick Erickson announced that he is joining CNN as a political contributor. Back in January, Politico noted that Erickson (pictured at right) and CNN denied a rumor floating around at the time that the Macon, Ga.-based conservative blogger would replace John King. It turns out Erickson will be a regular contributor to a brand new weekday evening program to be hosted by the veteran anchor. Entitled "John King, USA," the program will debut Monday, March 22. Erickson will also appear on other CNN programs to offer analysis and comment. “Erick’s a perfect fit for John King, USA, because not only is he an agenda-setter whose words are closely watched in Washington but as a person who still lives in small-town America, Erick is in touch with the very people John hopes to reach,” CNN political director and vice president of Washington-based programming Sam Feist was quoted as saying in the network's official press release. NewsBusters extends our congratulations to Erickson and wishes him all the best in bringing conservative perspective and analysis to the network. 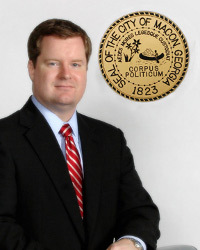 Photo of Erickson via the Web page for the Macon [Ga.] City Council, where Erickson serves as a city councilman.